A light-activated material capable of chemically converting carbon dioxide into carbon monoxide without producing unwanted byproducts has been developed by Scientists. This accomplishment marks a major step forward in developing technology that has the potential to produce fuel and other energy-rich products by using a solar-powered catalyst while modifying levels of a potent greenhouse gas. The material, a “spongy” nickel organic crystalline structure, transformed the carbon dioxide (CO2) in a reaction chamber fully into carbon monoxide (CO) gas when exposed to visible light. The CO gas can be then converted into solvents, liquid fuels and other useful products. The work was published in the July 28th edition of the journal Science Advances by an international research team headed by Scientists at the Department of Energy’s Lawrence Berkeley National Laboratory (Berkeley Lab) and Nanyang Technological University (NTU) in Singapore. In chemistry, reduction is considered to be the gain of electrons in a reaction and oxidation refers to when an atom loses electrons. One of the most popular examples of carbon dioxide reduction is in photosynthesis, when plants transfer electrons from water to carbon dioxide while producing oxygen and carbohydrates. Carbon dioxide reduction requires catalysts to help in breaking the molecule’s stable bonds. The growing consumption of fossil fuels over the past century has led to an increase in the interest in producing catalysts for solar-powered reduction of carbon dioxide in order to generate fuels and also to obtain renewable sources of energy. Researchers have been specifically keen on eradicating competing chemical reactions in the reduction of carbon dioxide. 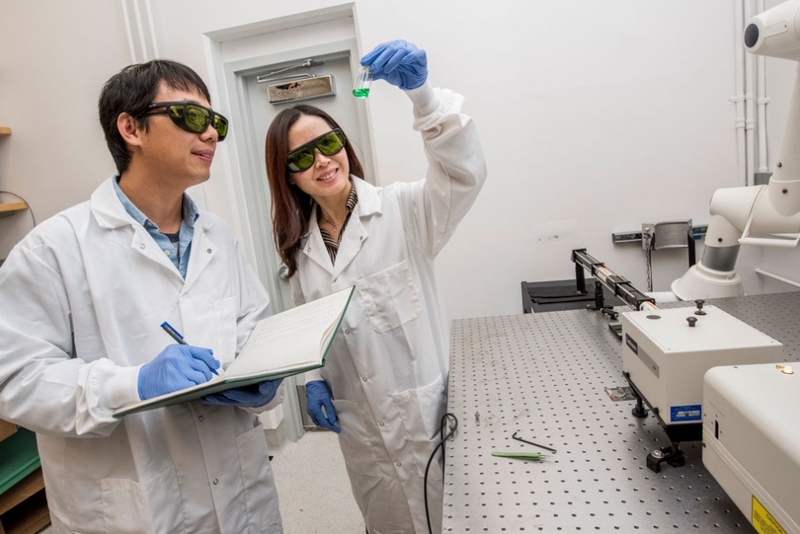 An innovative laser chemical method for producing a metal-organic composite material has been developed by Zheng and her colleagues at Berkeley Lab. Nickel precursors were dissolved in a solution of triethylene glycol and then the solution was exposed to an unfocused infrared laser, which started a chain reaction in the solution as the metal absorbed the light. The resulting reaction produced metal-organic composites that were then separated from the solution. At the Molecular Foundry, a DOE Office of Science User Facility at Berkeley Lab, the structure of the material was characterized by the Researchers. The nickel-organic photocatalyst comprised of prominent similarities to metal-organic frameworks (MOFs). MOFs have a normal crystalline structure with rigid linkers between the inorganic and organic components, whereas, this new photocatalyst integrates a blend of soft linkers of different lengths connected with nickel, producing defects in the architecture. At NTU, Scientists tested the new material in a gas chamber filled with carbon dioxide, measuring the reaction products by using mass spectrometry and gas chromatography techniques at consistent time intervals. These Scientists were able to determine that within an hour at room temperature, 1 gram of the nickel-organic catalyst was capable of producing 16,000 micromoles, or 400 milliliters, of carbon monoxide. They also established that the catalyst had a promising level of stability that permitted it to be employed for a prolonged time period. Carbon dioxide reduction by catalysts is not new, however other materials normally produce multiple chemicals in the process. The Researchers emphasized that a new level of selectivity and control was represented by the near-total production of carbon monoxide with this material. The Researchers have a few thoughts about how this selectivity takes place. They propose that the architecture of their photocatalyst allows easy binding of carbon dioxide anions to reaction sites, leaving minimal space for hydrogen radicals to land. This indeed would restrict the proton transfers required for producing hydrogen gas, the Researchers said. The nickel-organic photocatalyst was pushed further by the Researchers by enriching it with silver nanocrystals or rhodium in order to produce acetic and formic acids, respectively. Formic acid, present in stinging nettles and ant venom, and acetic acid, the key component of vinegar, are both extensively used in industry. The Researchers, more importantly, noted that the molecules of these products are characterized by two-carbon links, a step moving closer to the production of higher-energy liquid fuels with increased carbon bonds. Other Authors on this paper are Co-corresponding Author Rong Xu, NTU Associate Professor of Chemical and Biomedical Engineering; You Xu, NTU Research Fellow in Xu’s lab; Visiting Scholar Haicheng Wang and Scientist Joel Ager at Berkeley Lab’s Materials Sciences Division; and Karen Bustillo, a Scientific Engineer at the Molecular Foundry. This work was supported by the DOE Office of Science. Additional characterization work was performed at the Center for Functional Nanomaterials at Brookhaven National Laboratory, also a DOE Office of Science User Facility.